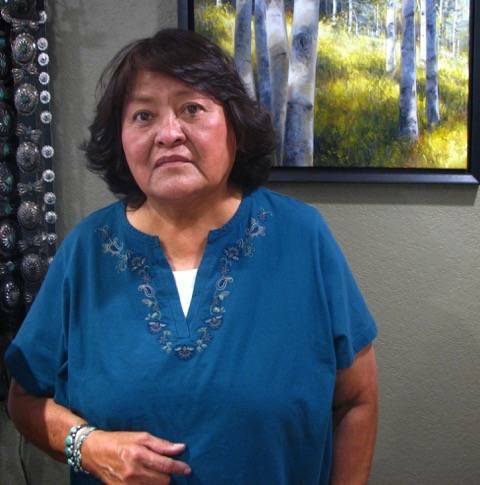 Wilson and Carol Begay are traditional Navajo silversmiths. These talented silversmiths have been creating traditional Navajo jewelry since 1969. They came from families well known for their jewelry making. Wilson’s father, Luke, taught John Adair, author of “Navajo and Pueblo Silversmiths” how to make sand cast jewelry. He worked for many years with Mike and Dean Kirk, at the famous Kirk Brothers Trading Company in Gallup, New Mexico. Carol’s parents, Angela and Allen Chee were both silversmiths who worked by C.G. Wallace, the famous jewelry trader from Zuni, New Mexico. The Begays began their career making sandcast jewelry, a traditional type of Navajo jewelry that requires the artist to make carvings in Tufa stone to make forms to shape molten silver. They first worked for Tobe Tupen, a well known trader in Gallup. Carol remembers that silver was only $1.25 an ounce when they started. Today they are independent artists whose work is widely sought after and admired. Wilson concentrates on the casting and building the foundations of the jewelry and Carol sets the stones and does the finishing work. They work together to design their jewelry. Traditional sandcast silver jewelry is a unique Navajo art form. The process, although it sounds simple, requires careful discipline and years of practice to obtain quality results. The artist takes two pieces of pumice stone and grinds them together to create two flat surfaces. Then the design is carved into one of the two pumice stones. An opening is carved from the design to the top and bottom of the stone. The two pieces of stone are then tied together so that the carved design is between the two flat areas. Silver is then melted in a crucible, and when it reaches the proper molten form, it is poured into the opening on the top of the design. If it is the proper temperature, it flows through to the bottom where it cools and hardens, filling the design space. After cooling, the stones are separated, the casting removed and the protrusions on the top and bottom are cut off. The silver is then filed smooth and shaped. If stones are to be set on the piece, the artist builds a silver bezel to hold the stone and then solders it to the piece of jewelry. Sawdust is put in the bottom of the bezel to cushion the stone and the bezel is tightened. The piece is then polished to the shine the artist likes. Wilson Begay of Gallup is the acknowledged master of the art of sandcast jewelry. Luke Begay, Wilson's grandfather, demonstrated this skill to John Adair in the early 1930's when Adair was conducting a survey of native silversmiths of the Smithsonian. Luke taught the skill to Wilson as a young man. Today, in his 60's, Wilson continues to make sandcast jewelry in his Gallup home. His wife, Carol, chooses the stones to be used and sets them in bezels. Both of their daughters, Nichole and Bonnie, are continuing the family tradition. Wilson's stamped signature is a flat brimmed Navajo hat with his initials under it. His signature is one of the most recognized in Indian jewelry. His work has won top awards at the Gallup Inter-tribal Ceremonial and is a "must have" for serious collectors of contemporary Indian jewelry.